Abu al-Qasim Mahmud ibn Umar al-Zamakhshari, known widely as al-Zamakhshari (in Persian: محمود زمخشری‎), also called Jar Allah (Arabic for "God's neighbour") (18 March 1075 – 12 June 1144), was a medieval Muslim scholar of Persian origin, who subscribed to the Muʿtazilite theological doctrine, who was born in Khwarezmia, but lived most of his life in Bukhara, Samarkand, and Baghdad. He was a great authority on the Arabic language as well as a rationalist theologian. Al-Zamakhshari was born in Zamakhshar, Khwarezmia, on 18 March, 1075 AD. He became a renowned scholar of the Mutazilite school of Islam. He used Persian for some of his work, although he was a strong supporter of the Arabic language as well as an opponent of the Shu'ubiyya movement. After losing one of his feet to frostbite, he carried a notarized declaration that his foot was missing due to accident, rather than a legal amputation for any crime. He is best known for Al-Kashshaaf, a seminal commentary on the Qur'an. The commentary is famous for its deep linguistic analysis of the verses, however has been criticised for the inclusion of Mu'tazilite philosophical views. For many years he stayed in Mecca, for which he became known as Jar-Allah ("God's neighbour"). He later returned to Khwarezm, where he died in 1144 at the capital Gorgan (in the present Gulestan Province, Iran). He studied at Bukhara and Samarkand while enjoying the fellowship of jurists of Baghdad. Al-Zamakhshari died in the Monday night of 8th Zulhijja, 538 AH/ 12 June, 1144 AD. The author of more than fifty books, Zamakhshari's fame as a scholar rests upon his commentary on the Qur'an. In spite of its Mu'tazili theology it was famous among scholars. Al-Kashshaaf ("the Revealer", Arabic: کشاف ) — A tafsir of the Qur'an) It's one of the most studied Qura'nic commentaries, itself receiving more than 80 commentaries. The greater part of the surviving vocabulary of the now extinct Iranian Kwaresmian or Chorasmian language is found in the form of interlinear glosses throughout a single manuscript (of ca. 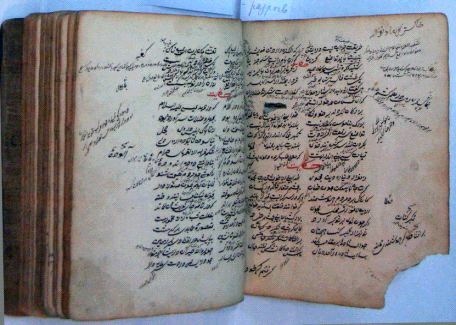 596/1200) of Zamakhshari's Arabic-Persian dictionary, the Muqaddimat al-adab (Zamakhshari may himself have been a native speaker). Some other manuscripts of this work also contain a few such glosses. Thus the Muqaddimat al-adab is a very important primary source for the study of this extinct language. ^ "Zamakhshari" in Encyclopedia of Islam, by C.H.M. Versteegh, Brill 2007. Excerpt: "one of the outstanding scholars of later medieval Islamic times who made important contributions..despite his own Iranian descent, a strong proponent of the Arab cause vis-à-vis the Persophile partisans of Shabiyya." ^ Hodgson, Marshall G.S (1977). The Venture of Islam Volume 2: The Expansion of Islam in the Middle Periods. USA: The University of Chicago Press. p. 308. ISBN 978-0-226-34684-7. Chisholm, Hugh, ed. (1911). "Zamakhsharī" . Encyclopædia Britannica. 28 (11th ed.). Cambridge University Press. p. 951. ^ Samuel Marinus Zwemer, "A Moslem Seeker After God"